Co. Sligo: Ballinafad, Kilmactrany, Kilshaloy, Shancough, Toomour. Co. Sligo and Co. Mayo: Coolavin, Kilfree, Kilturid. Co. Sligo and Co. Roscommon: Ardcarn, Ballinamein, Boyle (3), Breedoge, Croghan, Keaden (2), Rockingham, Shankill. The Board also included 6 ex-officio Guardians, making a total of 25. The Guardians met each week on Saturday at noon. The population falling within the Union at the 1831 census had been 65,662 with divisions ranging in size from Kilturid (population 2,128) to Boyle itself (11,921). The new Boyle Union workhouse was erected in 1840-1 on a six-acre site at the south of Boyle. Designed by the Poor Law Commissioners' architect George Wilkinson, the building was based on one of his standard plans to accommodate 700 inmates. Its construction cost £6,885 plus £1,414 for fittings etc. The workhouse was declared fit for the reception of paupers on 6th December 1841, and received its first admissions on 31st December. The workhouse location and layout are shown on the 1914 map below. The buildings followed Wilkinson's typical layout. An entrance and administrative block at the east contained a porter's room and waiting room at the centre with the Guardians' board room on the first floor above. It appears later to have been extended at each side with the addition of children's accommodation and school-rooms. The main accommodation block had the Master's quarters at the centre, with male and female wings to each side. At the rear was a range of single-storey utility rooms such as bakehouse and washhouse with the infirmary and idiots' wards in a separate block at the west. On several occasions during 1843, up to 60 police were were employed in enforcing the collection of rates at places within the union. 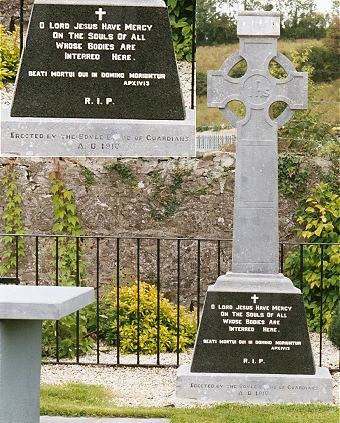 Military personnel were also used for this purpose, most notably at Ballymote in County Sligo where, in December 1843, around seventy men were deployed over a two week period. During the famine in the mid-1840s, sheds were erected to accommodate additional inmates. The idiot wards were extended to accommodate fever patients and a 44-bed fever hospital was erected at the south-west of the site. A burial ground was situated nearby. The workhouse buildings no longer exist. Part of the site is now occupied by a Western Health Board day centre and training centre. 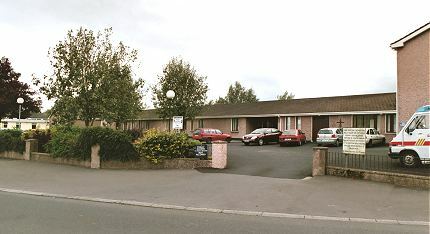 Boyle former workhouse site, 2003. A memorial to workhouse inmates buried in the workhouse burial ground was erected by the Board of Guardians in 1910. Boyle burial ground memorial, 2003.
www.boyleworkhouse.com - images, maps and plans of the workhouse, including a digital animated 'flyover', by Dave Derby.